The world is not what Riley Kordek imagined. 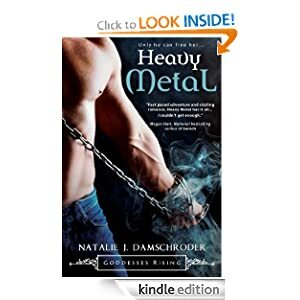 On the run from those who’ve targeted her, all Riley wants is a chance to figure out her new ability to bend metal’s energy. When a hot guy who knows more than he should helps her escape her attackers, she thinks she might’ve found someone who can lead her to the answers she needs. After being alone for so long, falling for Sam would be far too easy for Riley—and far too painful, once his old flame calls needing his help. Worse, Riley uncovers a plot with disastrous ramifications not only for herself, but for Sam and the people he loves—and potentially every goddess in the country. This book was decent. The concept of Gods and Goddesses was interesting. The heat between Riley and Sam was phenomenal. Hell, I could have moved things with my mind with how much he turned me on, and he's not real! I think the story was well written and holds the reader interested from beginning to end. I haven't read the first in this series, but I wasn't left in the dark. The author took that into account with this book.